In the summer of 2018, we visited Furush Beit Dajan – a village in the central Jordan Valley. Once a town with 7,000 inhabitants, there are now only 1,200 residents due to Israel’s policies of home demolitions and land grabbing. 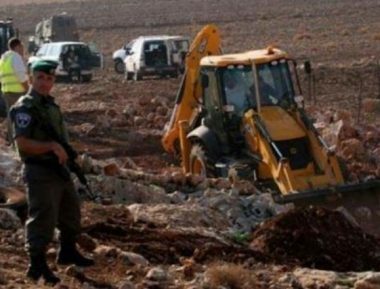 Surrounded by Israeli military bases, closed military areas, illegal settlements and bypass roads linking these settlements, 83% of the village’s land (about 10,000 dunums) has been seized by Israel, while the residents live now on just 3,000 dunums of land. The occupation uses water as a weapon to succeed in its goals of ethnically cleansing the area. In July 2018, Israeli forces, along with representatives of Israeli water company Mekorot, destroyed Furush Beit Dejan’s water pipes. Two months later, in September, residents – including school children – protested while the occupation forces once again destroyed water pipes to the community and the local school. The village’s water had previously been disconnected in 2017 by the Israeli occupation. Furush Beit Dajan’s residents sustain themselves through agriculture. Without water, Israel is not only stripping them of their livelihood, but the very lifesource needed to survive. Next door, the illegal colony of Hamra – which was built on the village’s land – enjoys an abundance of stolen water, with settlers growing 100 acres of dates, as well as bananas and citrus fruits. We interviewed the head of the village, 52 year old Tawfiq al-Hajj Muhammad. 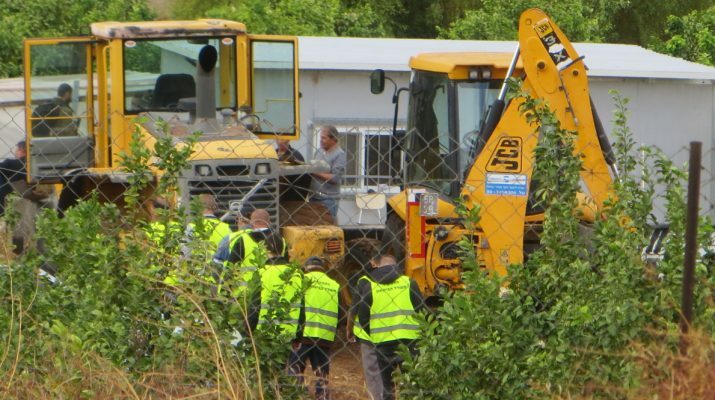 His family was made homeless twice in 2017 – first when their home was confiscated by the Israeli forces and Civil Adminstration, and secondly when their replacement home was demolished using a JCB bulldozer. When the Israeli authorities destroyed his home, they made Tawfiq, his wife and his seven children homeless. Their youngest child is just five years old. 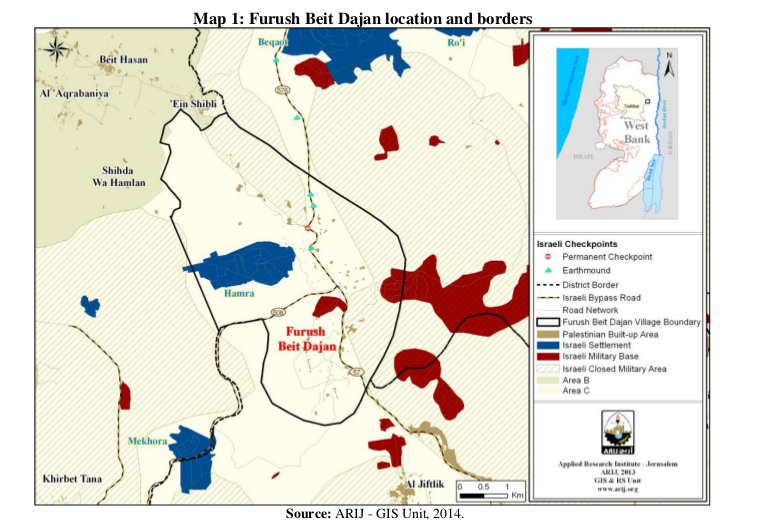 Roughly 90% of the fertile Jordan Valley is designated by Israel as Area C land, meaning that it is under full Israeli control and that it is illegal under Israeli law for Palestinian residents to build or renovate structures or connect to water sources. “The land belongs to my family and we have documents to show that we own it,” Tawfiq told us. Despite this, his land is still designated as Area C.
Tawfiq, what happened the first time the Israeli forces came to your land? It was March 2017 and I was sleeping in our mobile home – our family house. The Israeli military and Civil Administration came and aggressively woke me up. I couldn’t really control myself – I was trying to get the soldiers out. The soldiers looked like they were going to shoot me. My son has psychological problems and has problems talking and they targeted him more. They held their guns up to both of us. They took me away from the mobile home and handcuffed me. At the time my wife was with my other children on our farmland, so it was just me and my son there. They confiscated the home. They didn’t have any official papers or orders – they just took it. They’re thieves. They didn’t give it back and we had to buy a new one. And then they came again later in the year and destroyed your home? Yes. The soldiers came again on the morning of 21st November 2017 and they entered the farm with bulldozers. They gave us no warning that they were coming. I was there with two of my sons. The soldiers wouldn’t allow my sons to come close to our home. They were pushing my sons and shouting at them. My son with pyschological problems was there again. I was very worried about my children. They didn’t just destroy our house. They destroyed the foundations, the water pipes, the plants and flowers around it. They destroyed some of our crops. Now we are living in my brother’s house. Do you think you were targeted because you’re head of the council? They were using me to send a message because I am mayor of the village. I have supported everyone in the village by connecting their electricity and doing things for the village. Three years ago, it was my idea to make a water tank in Area C to give people drinking water in their homes and in the school. The soldiers came and gave us an order to destroy it. I also talk a lot to the Arabic media about the Israeli attacks and maybe this is a reason for them targeting me. Can you talk more about the pyschological effects on your son? He doesn’t want to stay in the Jordan Valley. He doesn’t really trust people – he doesn’t like talking to them or doing normal things. I had wished for my son to be active on the farm, to deal with the workers, to have a normal life…It was a good chance for my son to have a simple life and to be with nature. The rest of my family doesn’t feel safe. We’re thinking about our future, as we have to give my brother’s house back. We can buy a house in Area B which doesn’t have a demolition order, or maybe a house built prior to 1967 [houses built before the Israeli occupation of the Jordan Valley in 1967 are officially meant to be safe from Israeli demolition]. We’re thinking about leaving our extended family. Or we’re thinking about leaving the Jordan Valley but keeping our land for farming. Maybe I’ll buy another mobile home and construct it again – five times, ten times, one hundred times. Are you worried that the soldiers will destroy your farmland? I am not worried about them destroying greenhouses. If they destroy the greenhouses it’ll show international people how they’re attacking our resources. They kill children – so I won’t be upset about a greenhouse. It’s nothing. Do you think JCB holds any responsibility for the destruction of your home? If they don’t use JCB bulldozers maybe they will get bulldozers from another country. But at the same time it’s bad for a British company to have its name on the bulldozer which destroys our home, our lives. I thank you for trying to do something about this. Do you have a message to people elsewhere in the world? I wish for a future for the young and I wish for the international community to protect our young, to help us to give a future to our kids. I am looking to the international community to give us a future of peace. Our dream is to have safety, a nice house, to have football clubs, a health service, a nice life. Like many other families, Tawfiq’s family home was destroyed by a bulldozer manufactured by British company JCB. 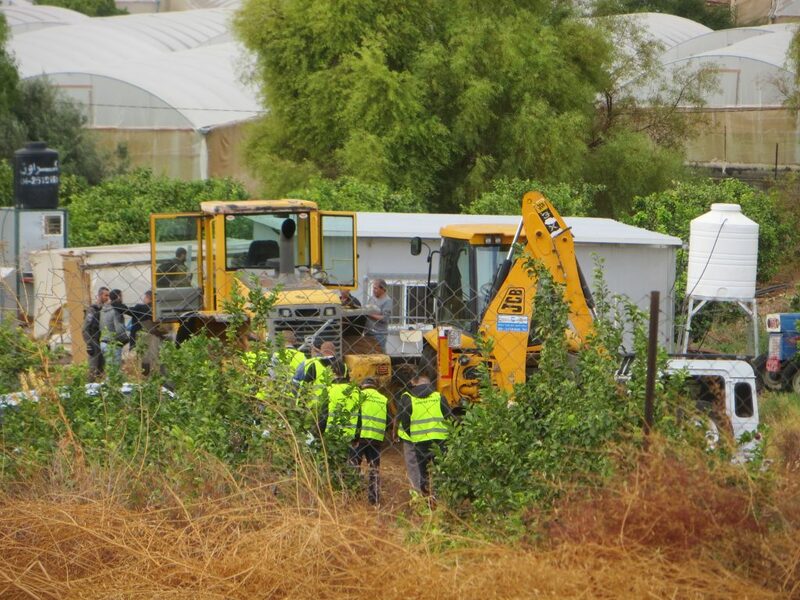 Furthermore, on the same day that their home was confiscated in March 2017, a JCB bulldozer was used by the Israeli forces to destroy a vegetable stall in the same village, owned by two families, destroying their livelihood. (See the video of the demolition on B’Tselem). 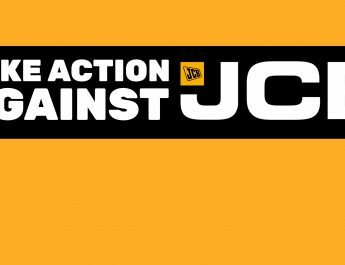 For ways to take action against JCB, see here. Thank you to Tom Anderson, Amy Hall & Lydia Noon for their contributions in the interview with Tawfiq. Most of the work we do is unpaid. Any donation, no matter how small, is greatly appreciated so that we can continue to investigate the companies compicit in the occupation of Palestine.